The Joker’s Back and This Time He Pays Up to 5000 Coins! Joker 5000 Wild is a retro slot game that’ll tickle your vintage fancy! Anyone who’s been playing slots for a few years will enjoy this trip down memory lane with Novomatic. Unlike other developers, such as NetEnt, Novomatic make a lot of simple slot games. They’re not interested in developing games that use the latest graphics or technology. They are known for basically making really great games. All of their slots are enjoyable to play, work flawlessly and pay out the big bucks! 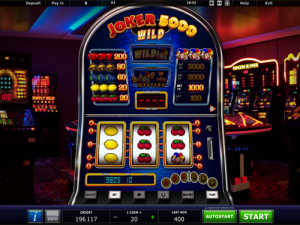 Joker 5000 Wild is very like another slot from Novomatic called Joker 2000. The only difference between the games are that in Joker 5000 Wild, the joker wears red, yellow and blue instead of red and green! What’s more, the joker symbol in this slot game can pay up to 5000 coins instead of just 2000! All of Novomatic’s great slot games, including Joker 5000 Wild and Joker 2000 are available to play on our website for free! You can browse through all of Novomatic’s slot games, table games and live games at your leisure. Our team have taken the time to review all of the games individually! You can get information about every game, its features and its payout percentage! Some of the most popular games from Novomatic are their jackpot slots. These include gems like: Book of Ra Deluxe Jackpot Edition, Cops n Robbers Millionaires Row, Wizard of Odds, Monkey’s Millions and Jingle Jackpot. All in all, there are only 6 symbols in Joker 5000 Wild. The game is played in coins! Before you start playing, you need to pay in some money. You can adjust the value of each coin, so any player with any budget can play comfortably. You can choose to play the game with a 5-coin bet per spin, a 10-coin bet per spin, a 20-coin bet per spin or a 40-coin bet per spin. Vintage-style slot symbols dominate this game! The cherries give the smallest payouts as they are the least valuable symbol, three cherries symbols give a payout if 20 coins. Similarly, three lemon symbols give a payout of 20 coins also. 3 grapes symbols give a payout of 60 coins. 3 golden bell symbols give a payout of 80 coins and 3 red seven symbols give a payout of 200 coins! The joker is going to be your best friend in this game, though! He gives the biggest payouts of them all. On a 5-coin bet, he can pay 100 coins. On a 10-coin bet, he can pay up to 1000 coins. On a 20-coin bet, the joker pays up to 2000 coins and on a 4-coin bet, the joker pays 5000 coins when you match three along a payline! The same rules apply to all of the symbols in the normal game. You have to spin the reels and land at least one matching symbol on each reel and on a payline. There are five paylines in Joker 5000 wild – three horizontal and two diagonal. They pay from left to right. When you get paid a win in coins in Joker 5000 Wild, you can do lots of things with it! You can collect your wins, gamble your wins or transfer your wins to the supermeter! Gambling is a simple 50/50 game where you have to choose between the red four-leaf clover and the black horseshoe. If you choose the right symbol, you’ll double the win that you gambled! You can then keep on going until you choose to collect or you get it wrong. If at any time you choose the wrong symbol before you collect, you’ll lose the whole amount – including the original win. If you choose to let your winnings be transferred to the supermeter, once it gets to 20 coins you can play the super game. You can play straight away or wait until you have more coins in the supermeter as this game can only be played with a 20-coin or 40-coin bet per spin. In the super game, the Joker acts as a Scatter Wild symbol and whenever you spin to Joker symbols, you’ll get a mystery win of any number of coins above 20!